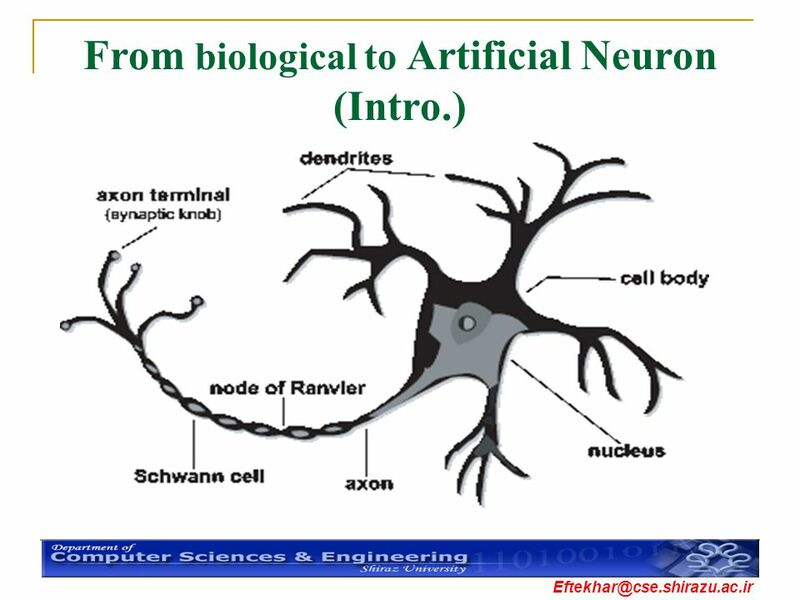 The neurons are parallel inside each other due to inherent structure of Neural Network. 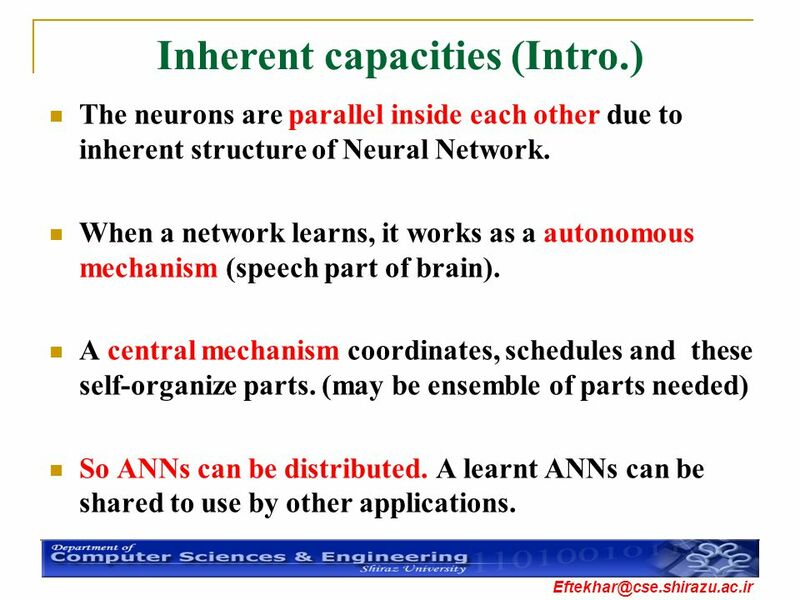 When a network learns, it works as a autonomous mechanism (speech part of brain). 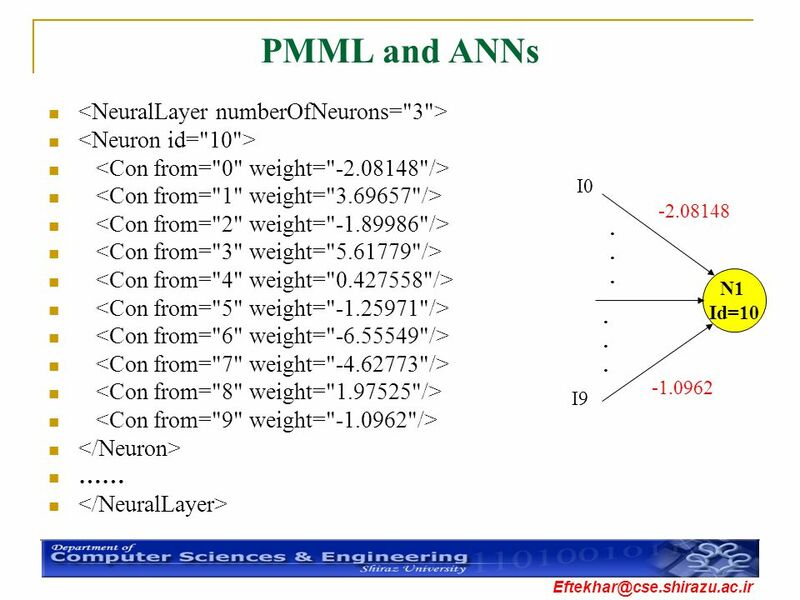 A central mechanism coordinates, schedules and these self-organize parts. 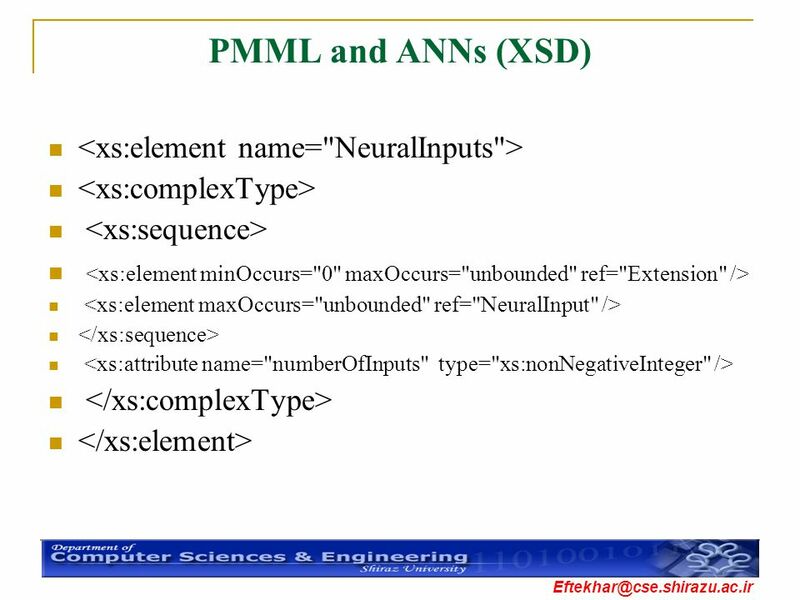 (may be ensemble of parts needed) So ANNs can be distributed. 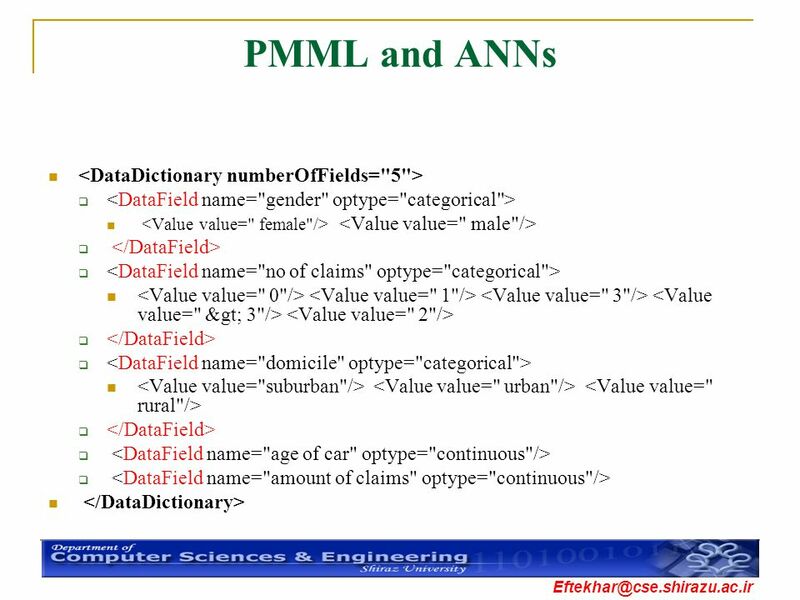 A learnt ANNs can be shared to use by other applications. 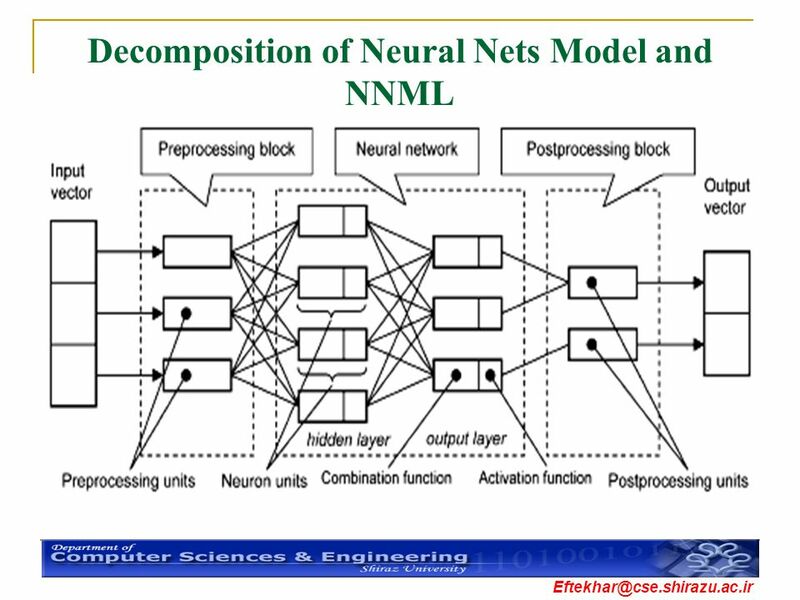 use a neural net to resolve complex jobs is not sufficient. 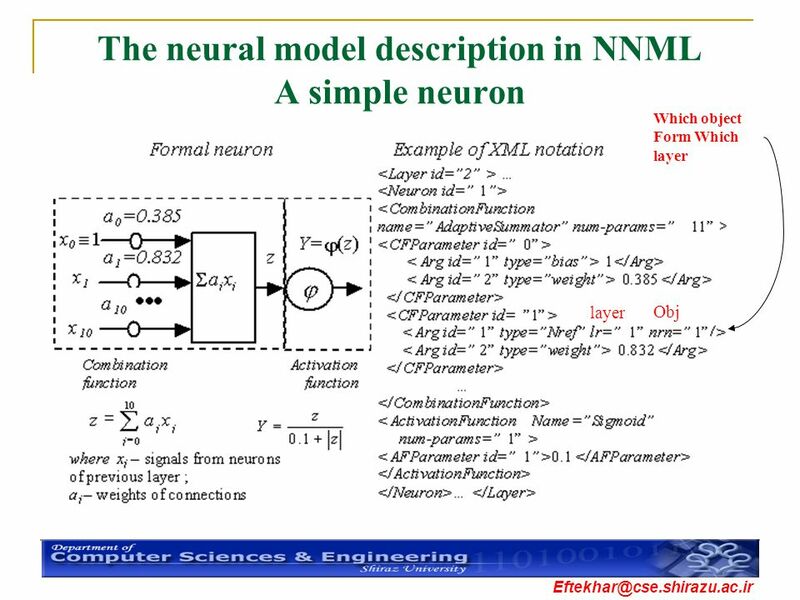 For complex problem, net can fall onto a local minima without finding the best results what must be developed is a mechanism to train many neural nets in parallel on the same problem, on several machines, governing the whole process from a central point. 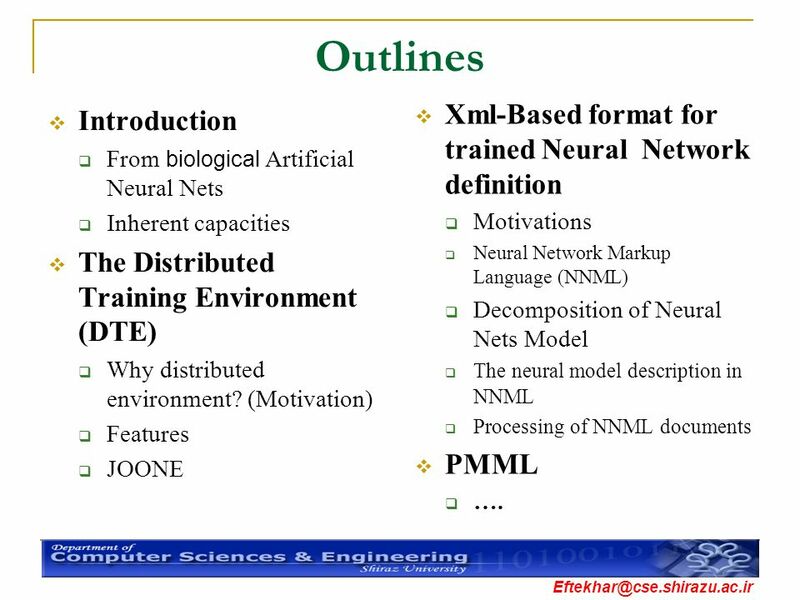 Joone is a FREE neural net framework to create, train and test neural nets Distributed Training Environment to train in parallel mode many neural networks to find the fittest one for a given problem. 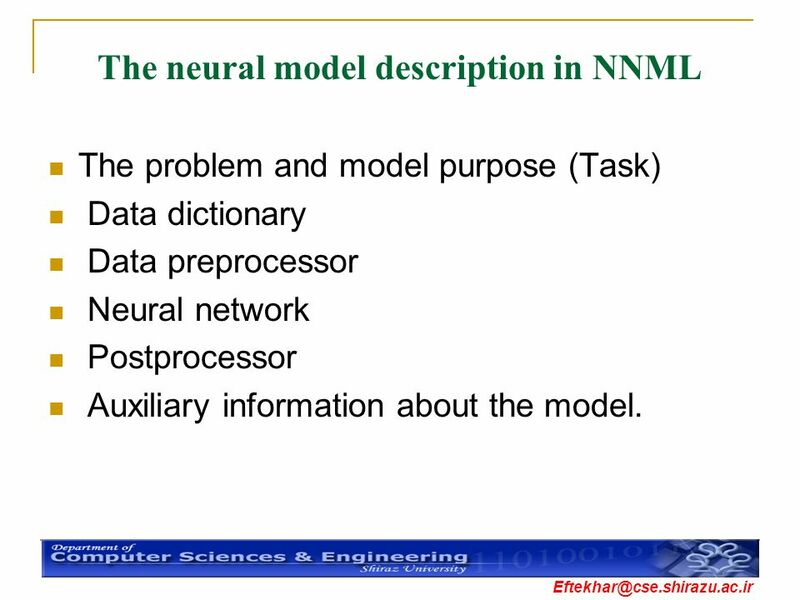 The problem and model purpose (Task) Data dictionary Data preprocessor Neural network Postprocessor Auxiliary information about the model. 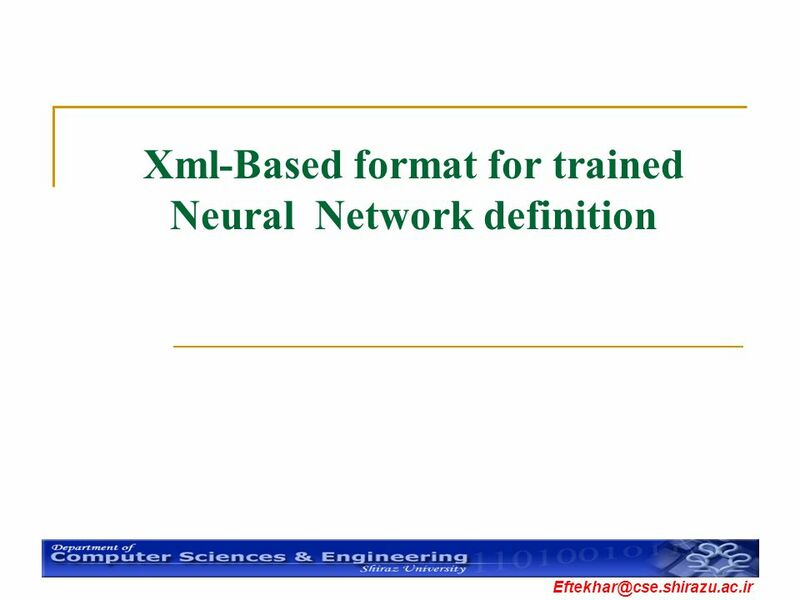 Generation and training by means of the neural network simulator. 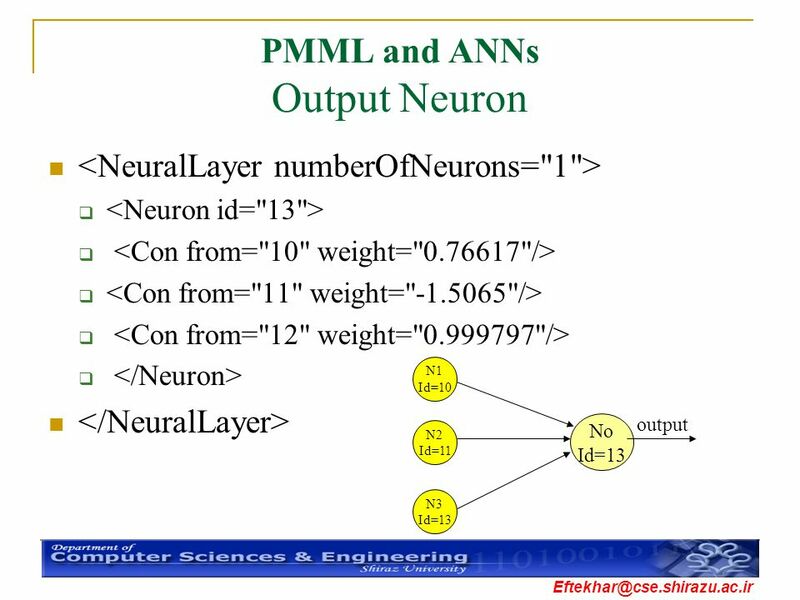 Creating hierarchical model by the interface module on the basis of internal representation. 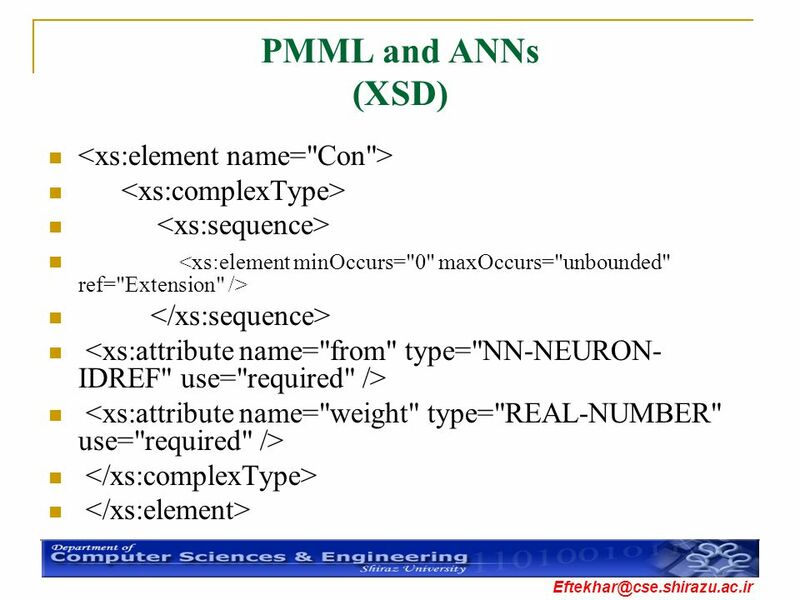 Methods of any XML parser are called, object tree of the model are constructed NNML file is generated. 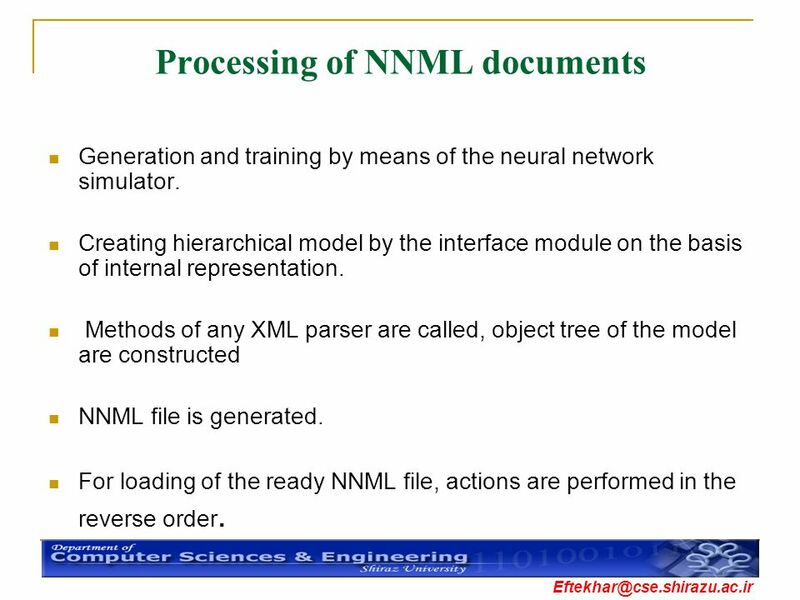 For loading of the ready NNML file, actions are performed in the reverse order. 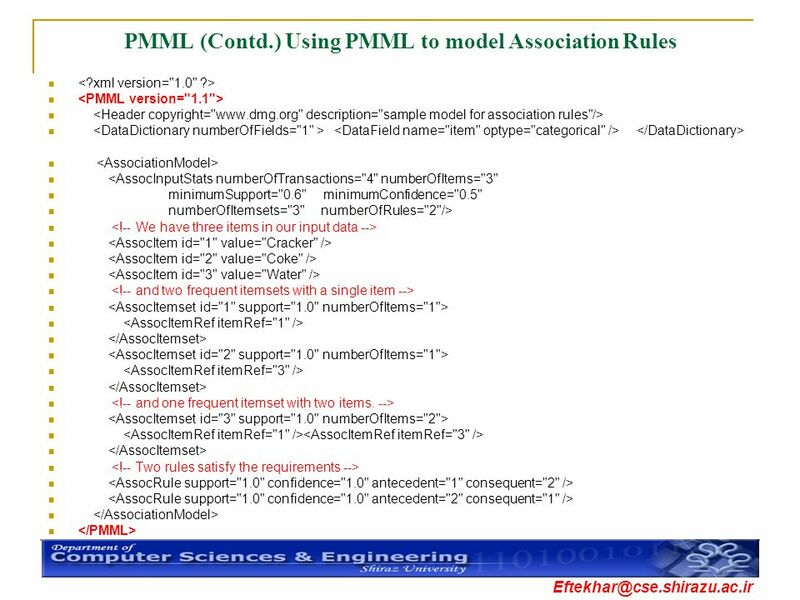 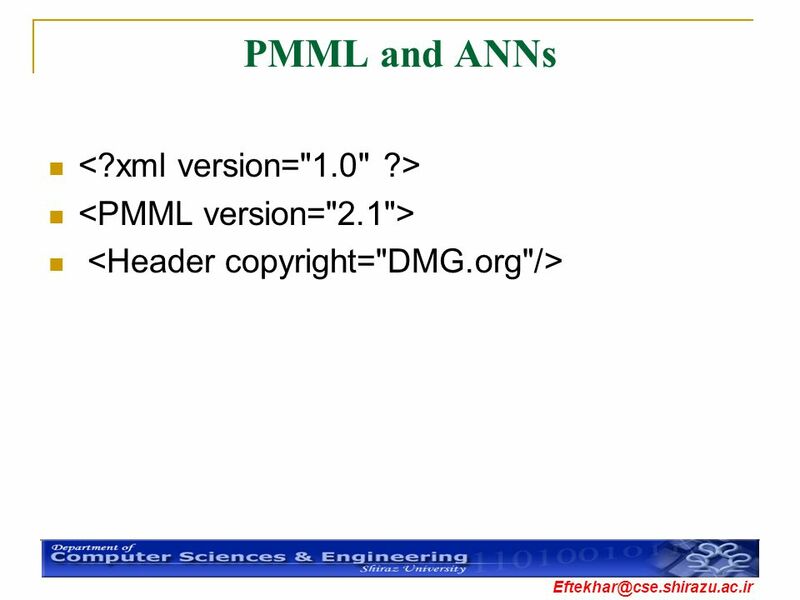 21 Introduction The PMML is a set of Document Type Descriptions (DTDs) specified in XML. 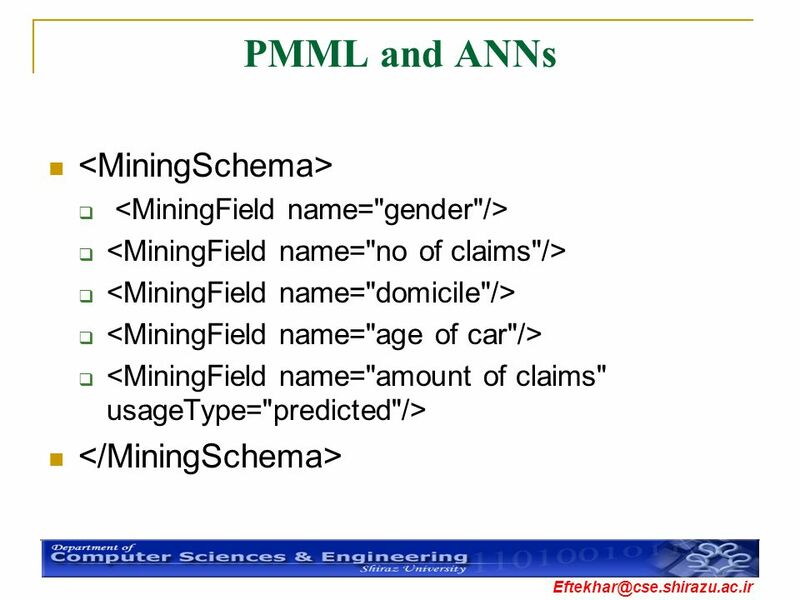 The first version (1.0) was provided in July by the Data Mining Group (DMG, A Markup Language for Predictive modeling, but not only restricted to this field. 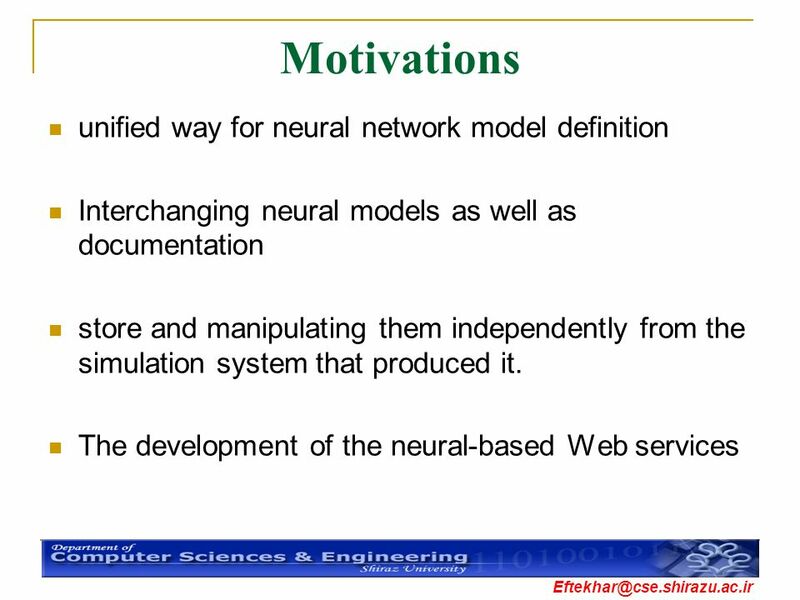 Support only Back propagation Nets despite of previous introduced Method. 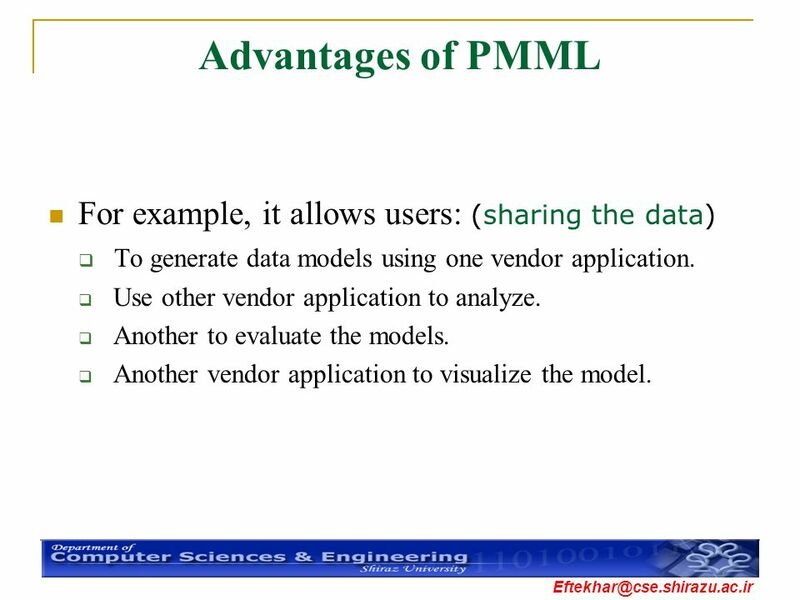 To generate data models using one vendor application. 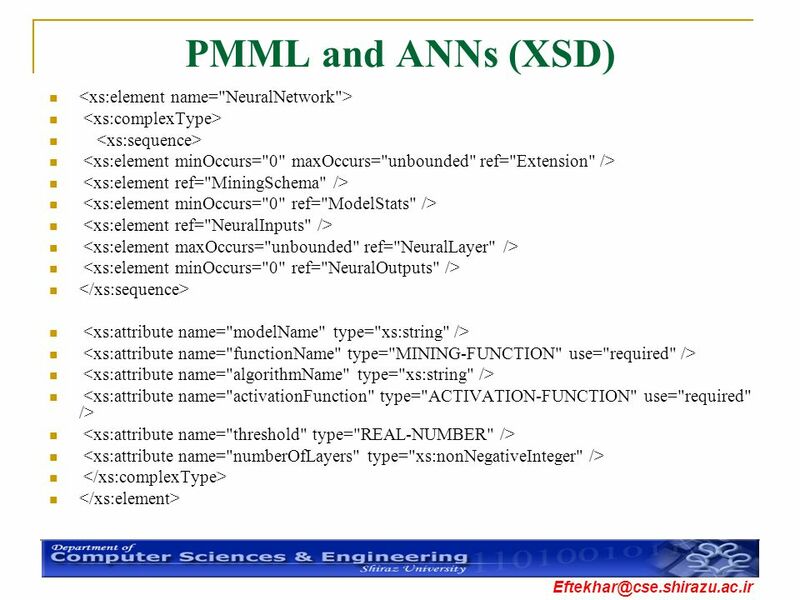 Use other vendor application to analyze. 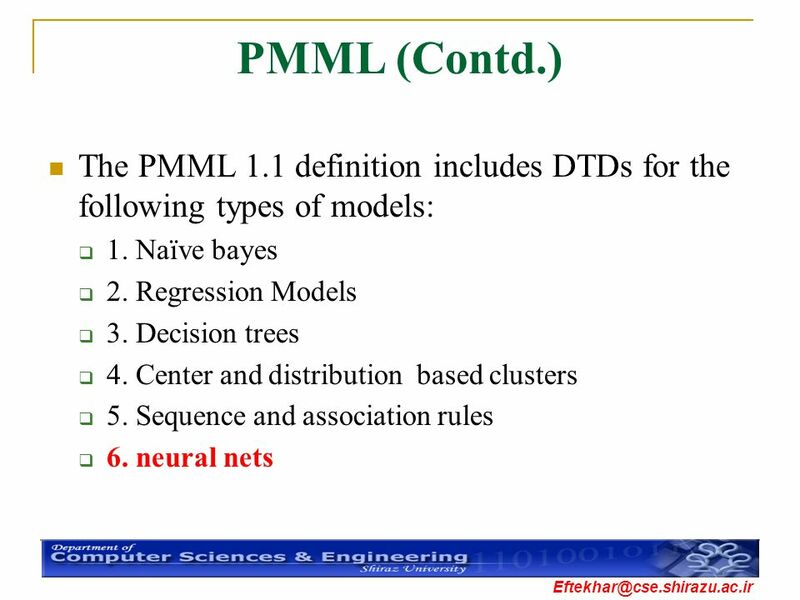 Another to evaluate the models. 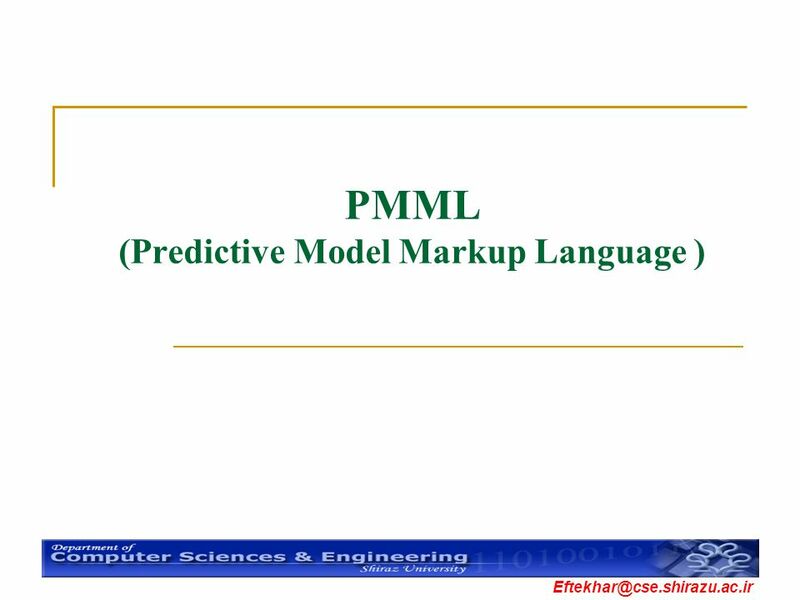 Another vendor application to visualize the model. 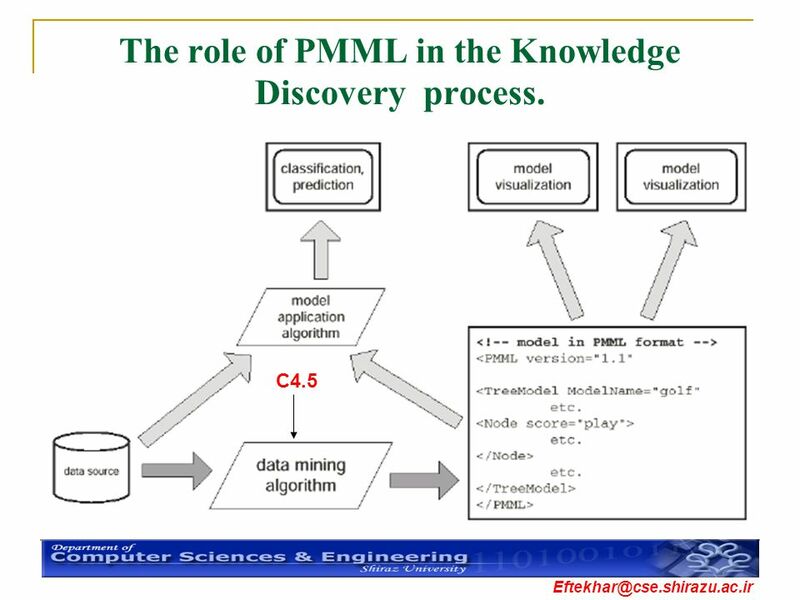 26 The role of PMML in the Knowledge Discovery process. 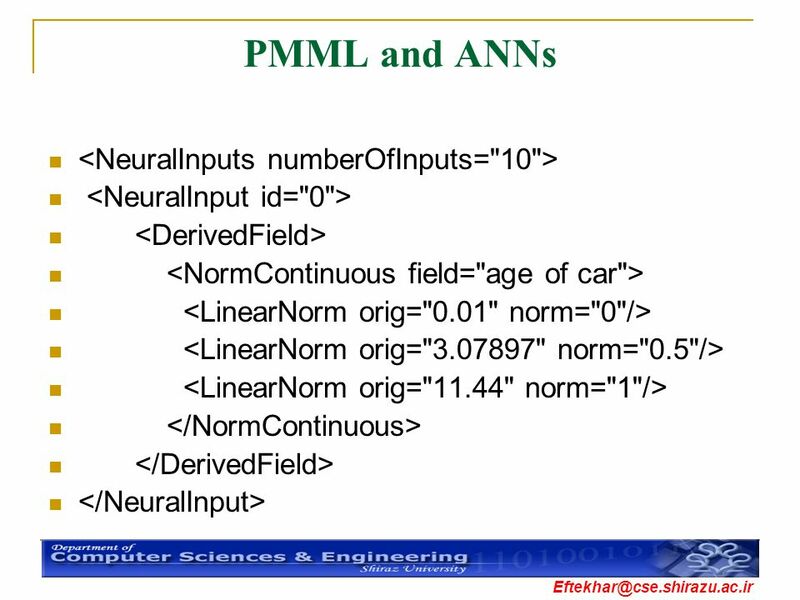 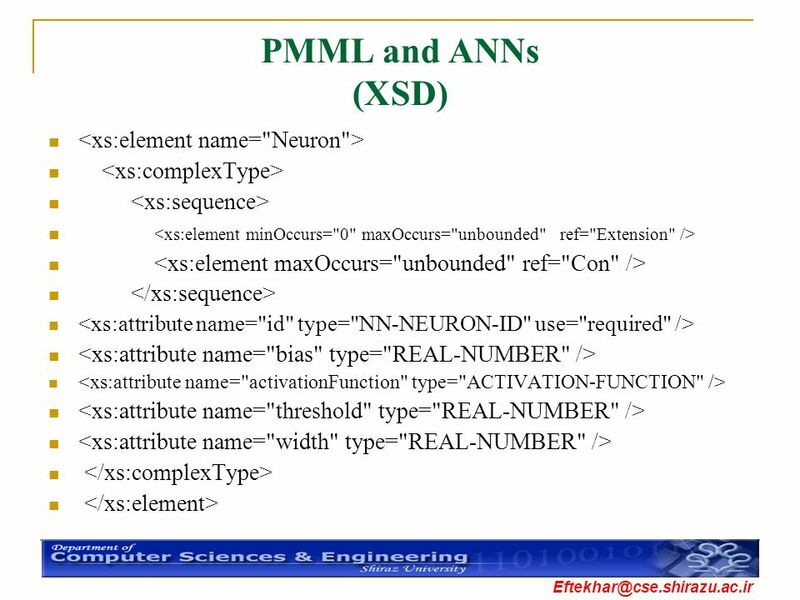 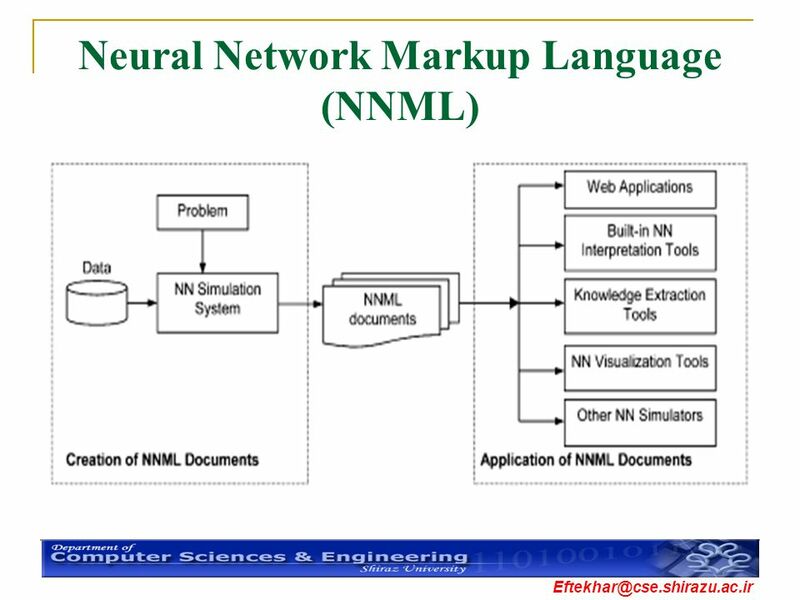 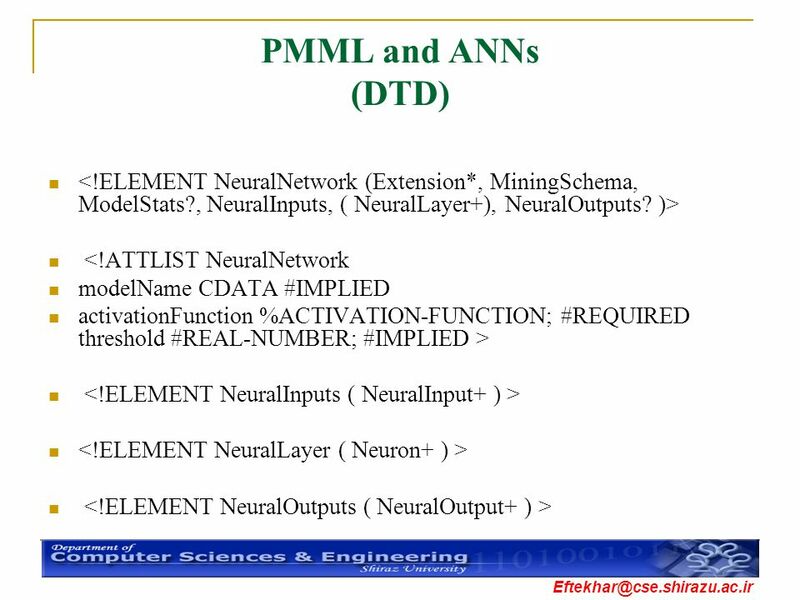 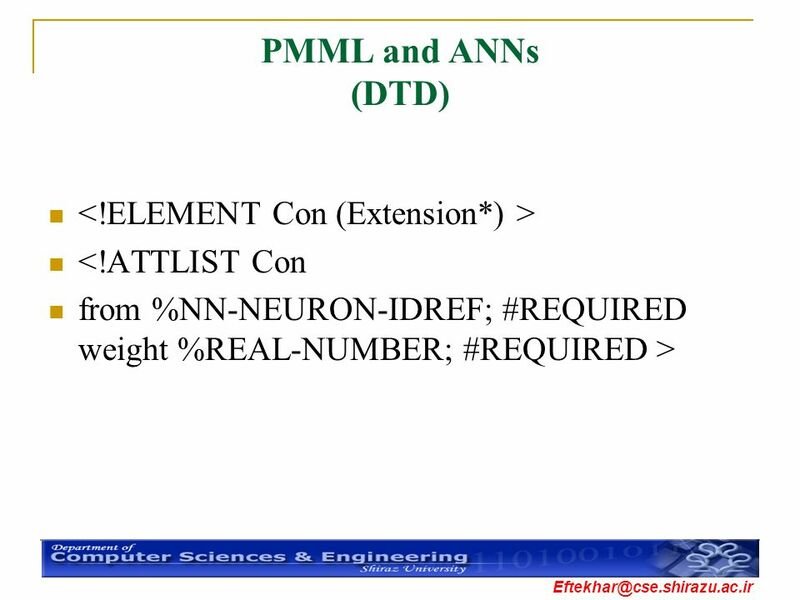 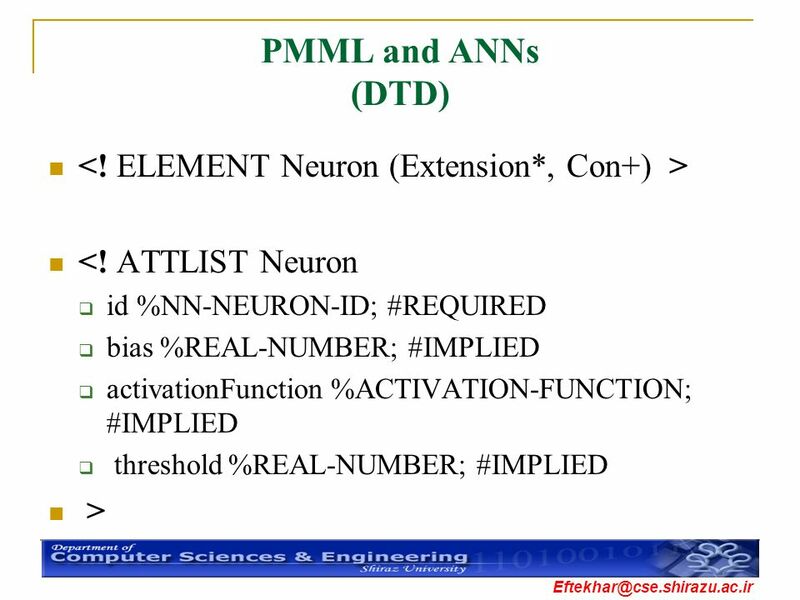 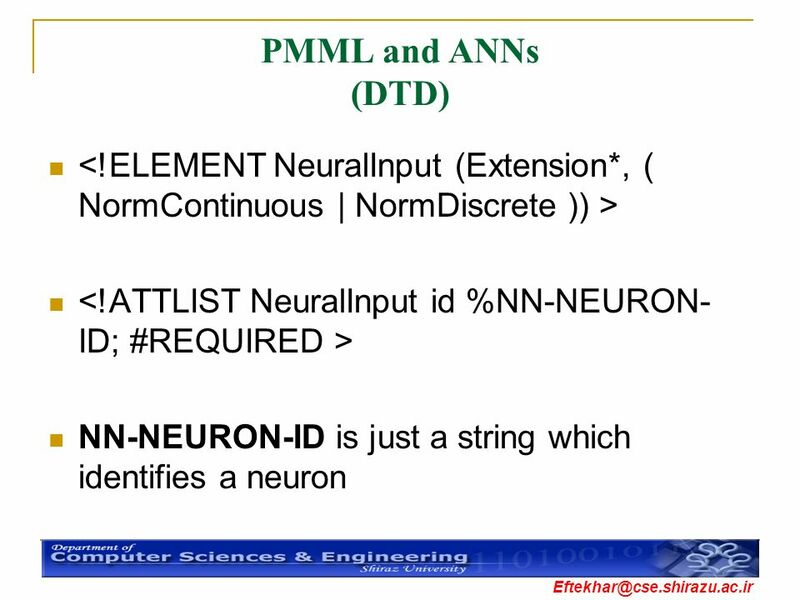 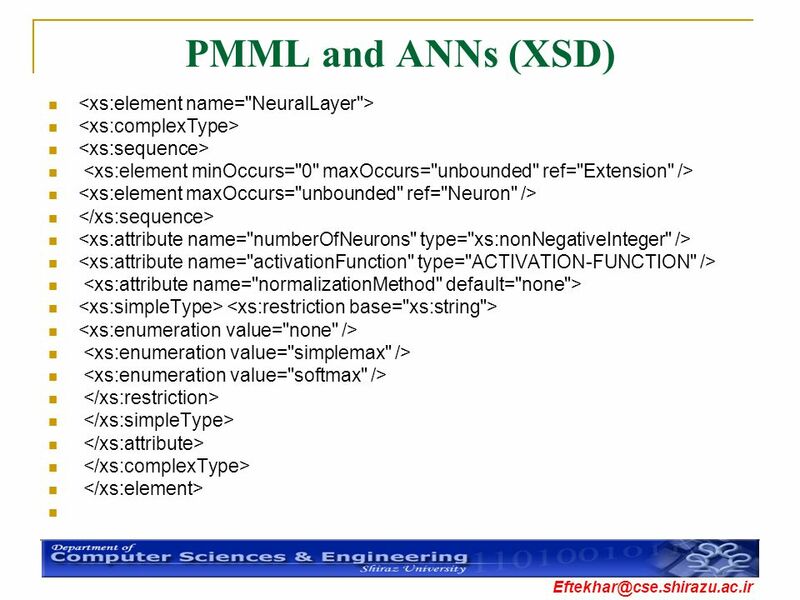 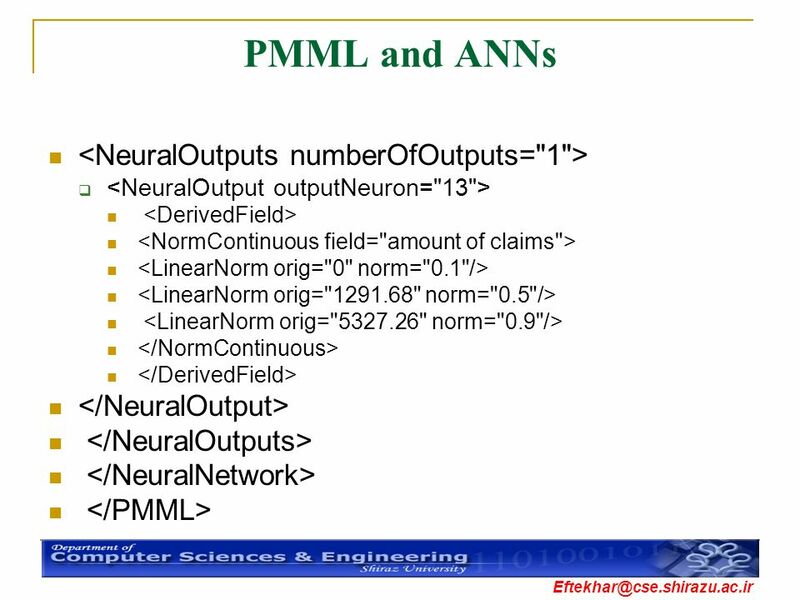 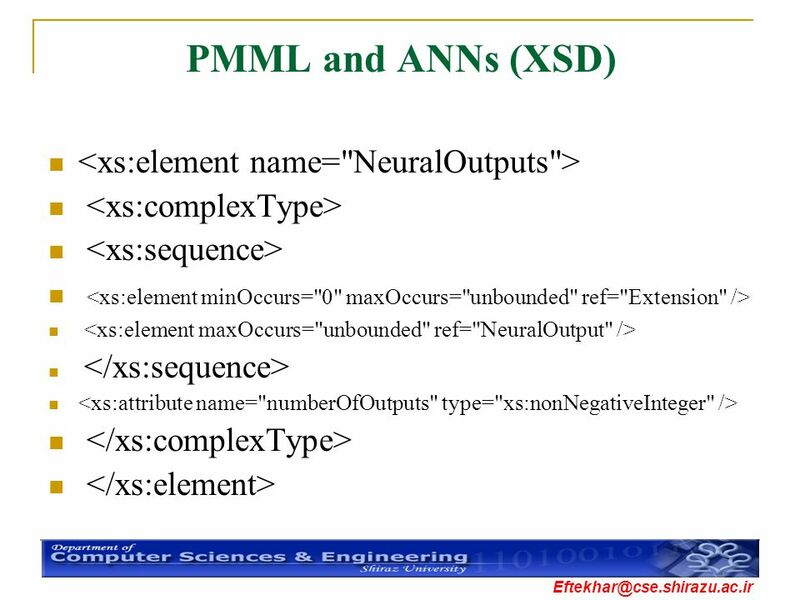 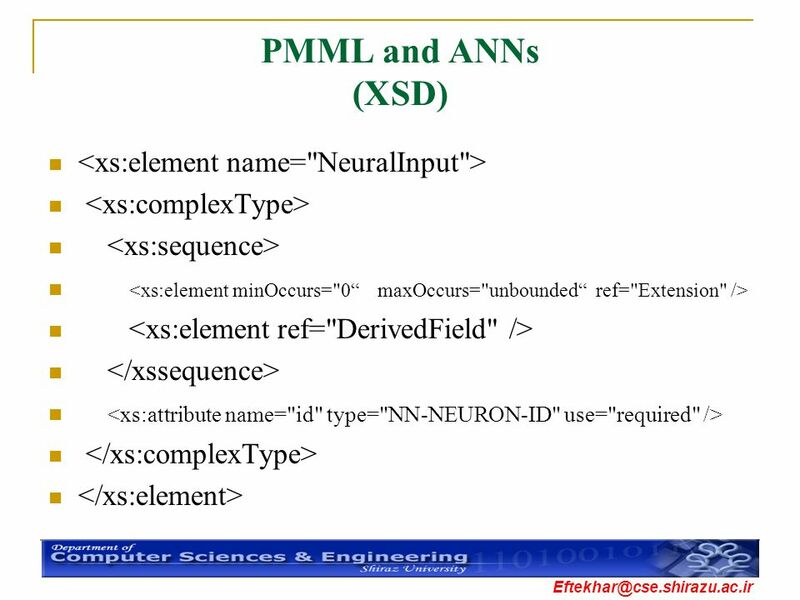 Download ppt "Artificial Neural Networks And XML"
Programming Languages for End-User Personalization of Cyber-Physical Systems Presented by, Swathi Krishna Kilari. 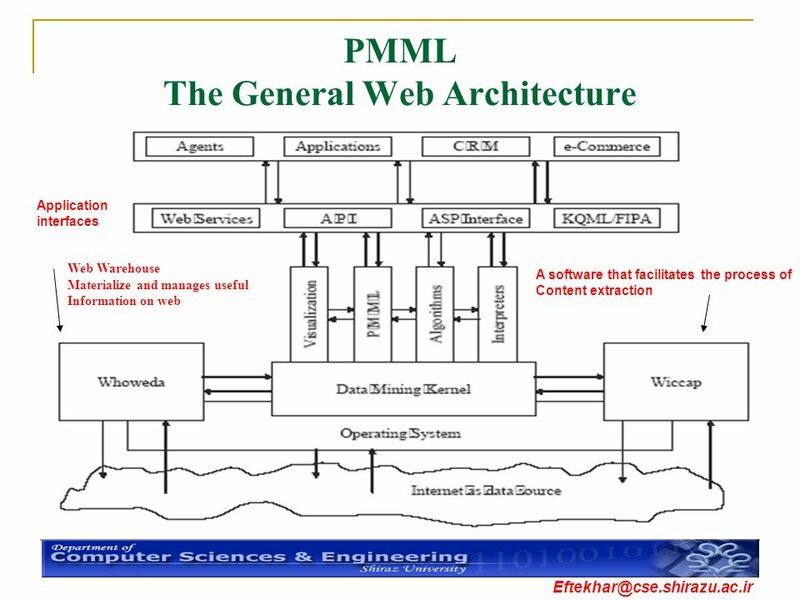 1 XML Web Services Practical Implementations Bob Steemson Product Architect iSOFT plc. 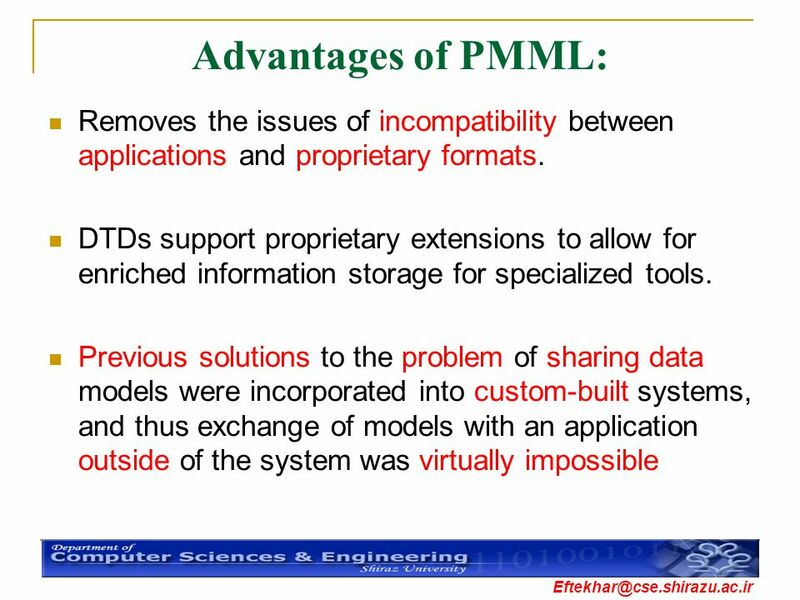 ©Ian Sommerville 2004Software Engineering, 7th edition. 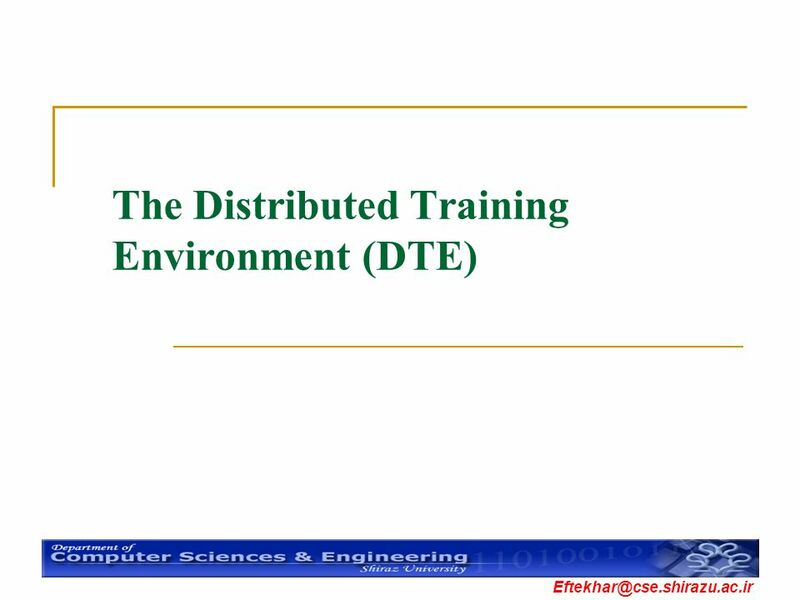 Chapter 12 Slide 1 Distributed Systems Design 2. 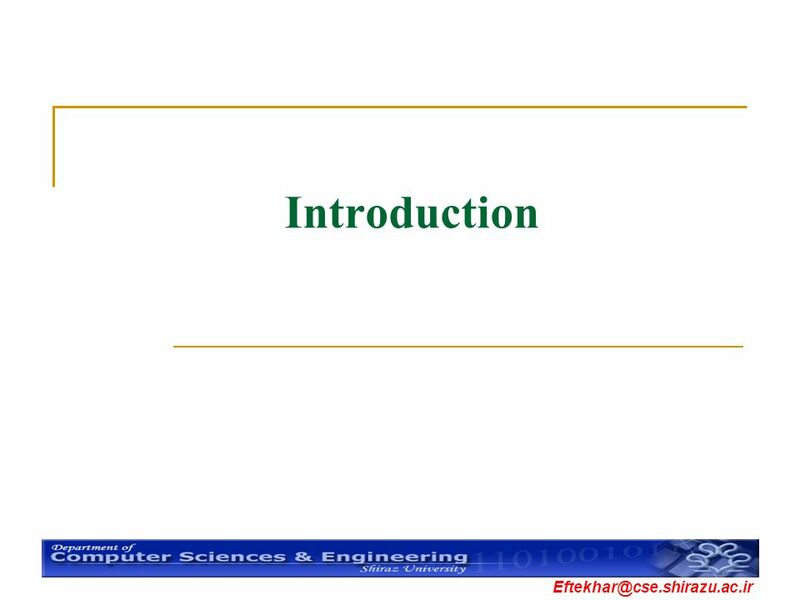 Video Table-of-Contents: Construction and Matching Master of Philosophy 3 rd Term Presentation - Presented by Ng Chung Wing. 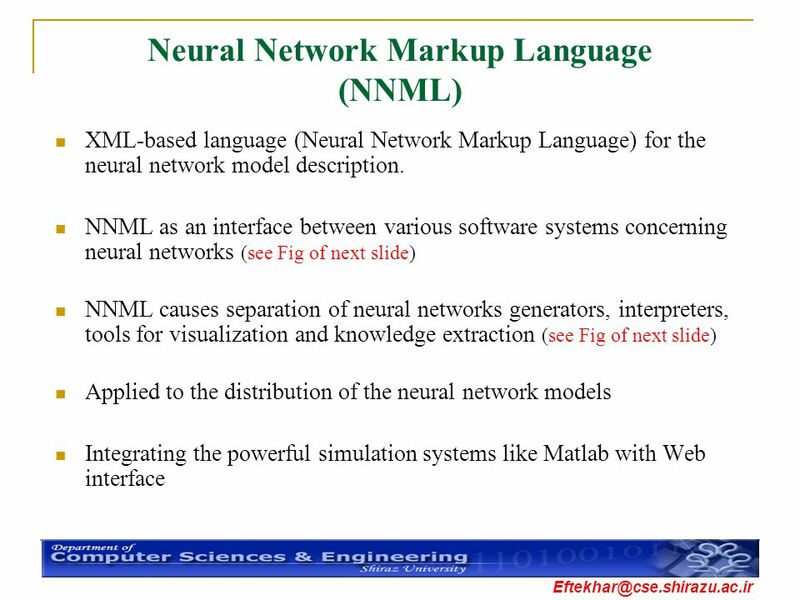 Visual Web Information Extraction With Lixto Robert Baumgartner Sergio Flesca Georg Gottlob. 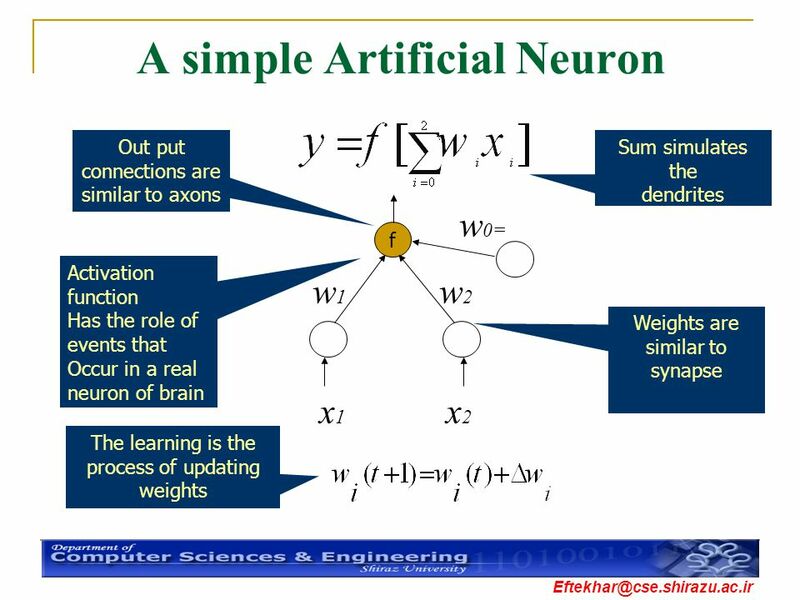 Modified from Sommerville’s originalsSoftware Engineering, 7th edition. 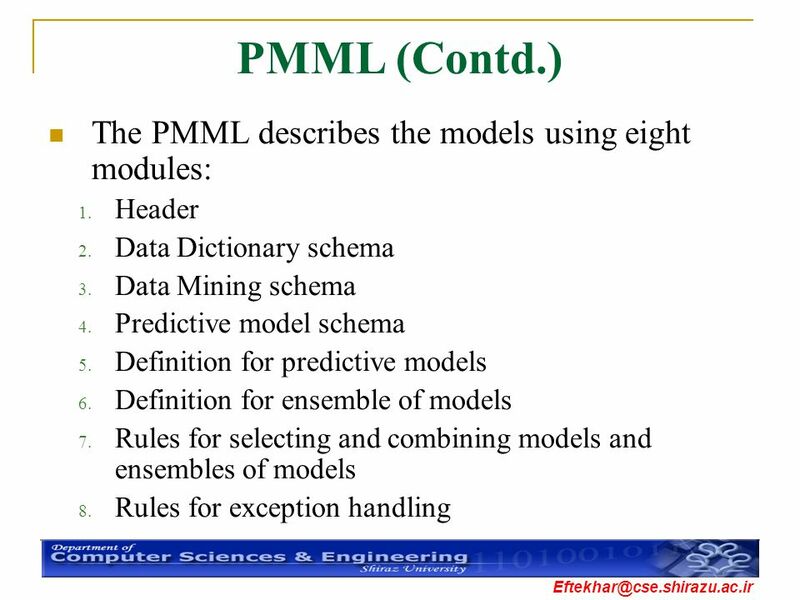 Chapter 8 Slide 1 System models. 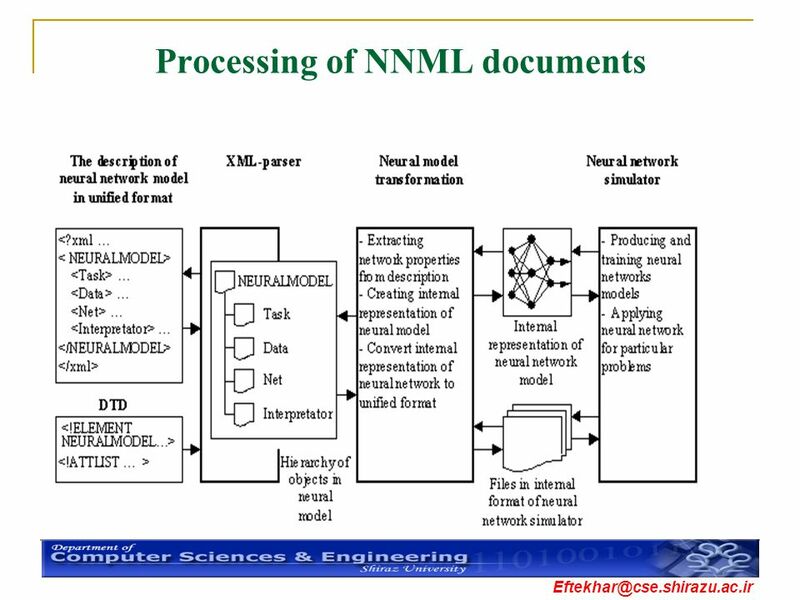 The Data Mining Visual Environment Motivation Major problems with existing DM systems They are based on non-extensible frameworks. 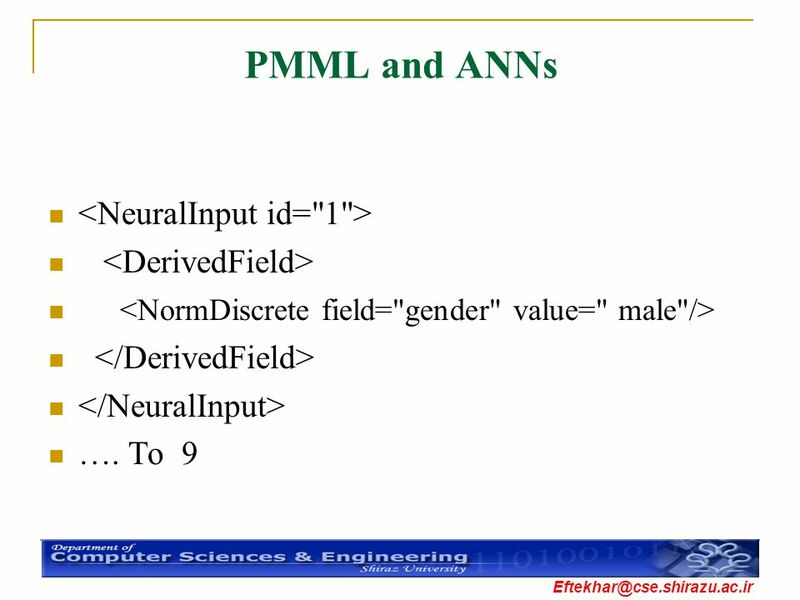 They provide a non-uniform. 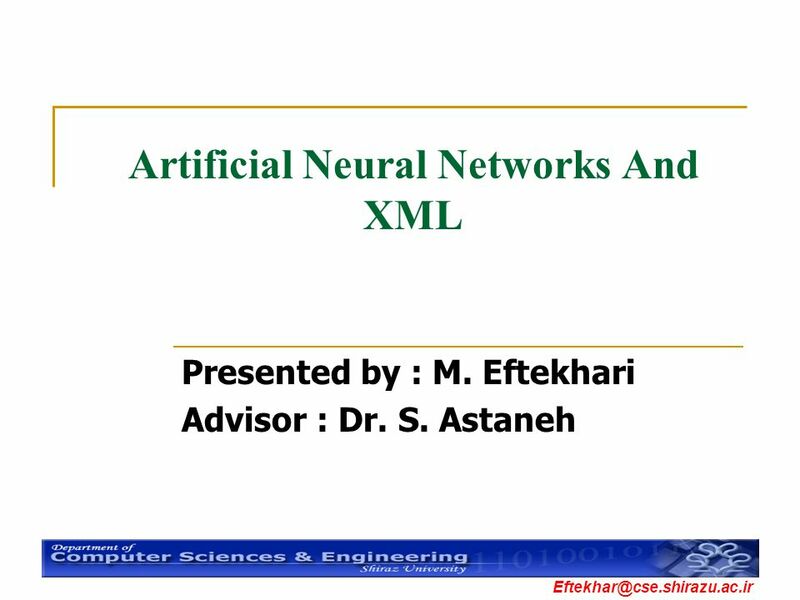 COMP9321 Web Application Engineering Semester 2, 2015 Dr. Amin Beheshti Service Oriented Computing Group, CSE, UNSW Australia Week 4 1COMP9321, 15s2, Week.